In the most populated parts of Costa Rica, especially the inland Central Valley region, the roads are paved and reasonably well-maintained. It’s easy to get around from place to place. Although, the country is mountainous and roads, aside from major highways, are narrow and winding, so it does take you quite a bit longer than you might think to cover a relatively short distance. But in off-the-beaten path spots and lightly populated rural areas, whether you’re in the mountains or on the coast, away from tourist centers, it’s a different story, and access can be difficult. Dirt and gravel roads in various states of repair could be a major part of your route, and a four-wheel drive vehicle a necessity. In some locations it’s easier to seek an alternative form of transportation. Regional airlines with small planes have tiny airports throughout Costa Rica. And at the beaches you also find water taxis and ferries. Drake Bay, on the far southern Pacific coast, is set on the wild Osa Peninsula. It’s isolated; a small beach town with a few restaurants, hotels, and eco-lodges. Many places are cash only, and there’s no ATM—something to keep in mind if you visit. It’s more a place to check out than live long term because of the lack of services. 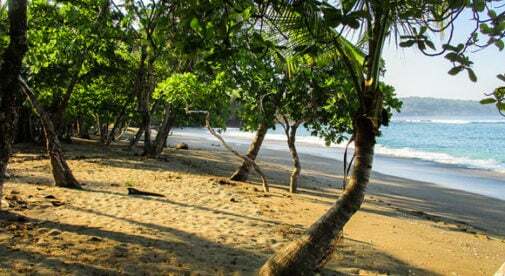 But if you want a place you can really get away from it all and be surrounded by wild rainforest and an undeveloped coastline, it could be your perfect retreat, if not full-time perhaps part of the year. Nearby is the world-famous Corcovado National Park, which is home to tapirs, scarlet monkeys, squirrel monkeys, and many other endangered species. Drake Bay is one of the gateways to the park, and a starting point for many tours there, and to the scuba diving mecca of Caño Island. But getting to Drake Bay can be tricky. The road is rough—very muddy in rainy season from May to November. And while there are flights in to the small airstrip, seating is limited. Many people travel in by water. From the town of Sierpe, you take a motorboat—referred to as a water taxi—down the Sierpe River until it hits the Pacific, and then head south. It’s an exciting journey that provides views of the surrounding jungle, dramatic coastal mountains, and the brilliantly blue Pacific.